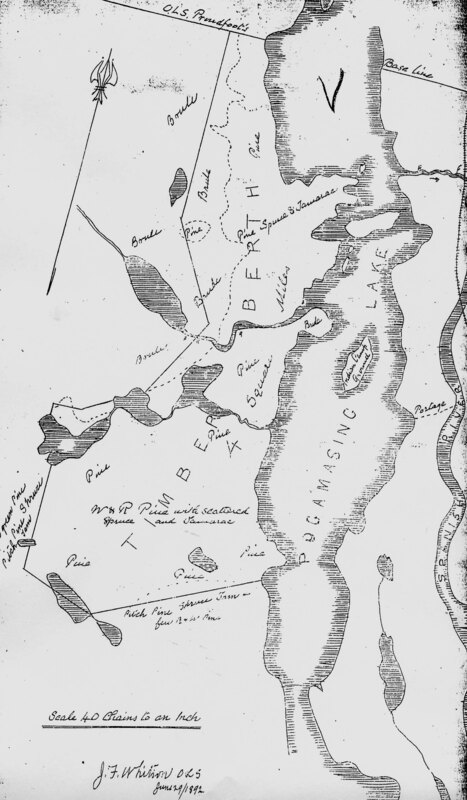 After reading Adam Shoalts’ excellent book on “A History of Canada in Ten Maps,” it occurred to me that a history of Lake Pogamasing could also be written in a similar manner. 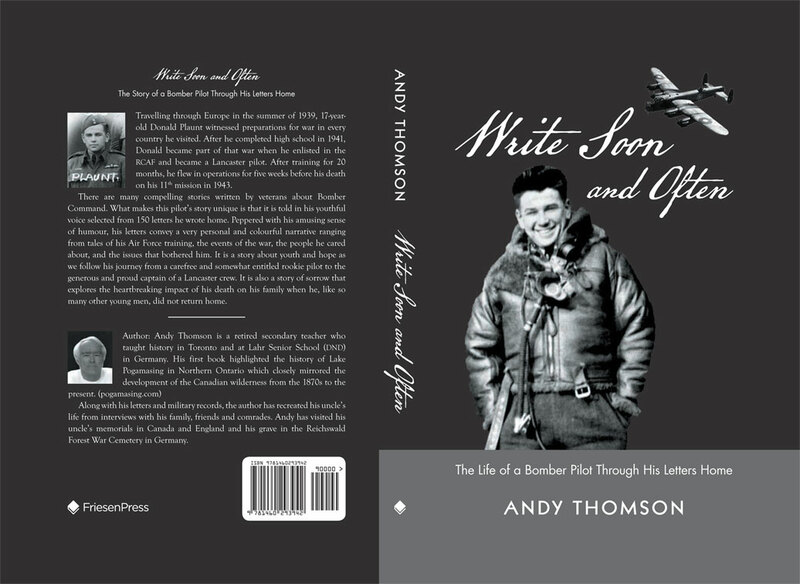 However, these maps will be about the development at Pog over the 200 years of its history, rather than a map of different areas of Canada as in Shoalt’s book. The ten plus maps I have chosen of the Pogamasing region range from blank spaces to detailed representations as the area opened up. 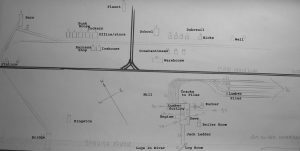 Maps also illustrate the history of the area, as they inform us of the different stages of development and knowledge of the area. The first inhabitants of the area did not draw maps because they carried a mental picture in their head. 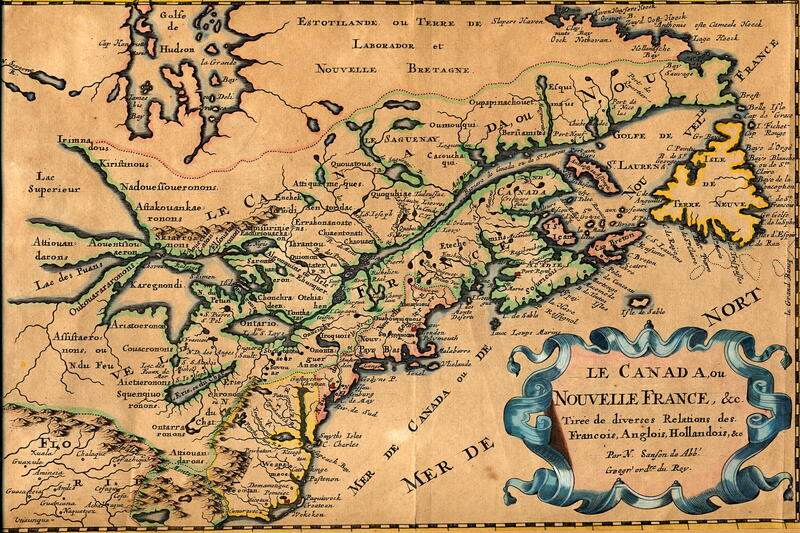 However, the early French explorers had another purpose to map their travels: looking for a route to China and establishing sovereignty of the new territory. 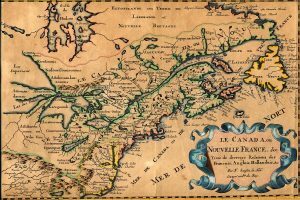 The first maps of the wider area were created by the French, most notably by Samuel Champlain and a well-known map maker, Nicholas Sanson. 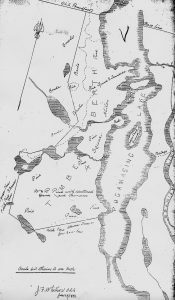 This map, drawn circa 1660, shows that the first map makers knew very little about the North Shore area of Lake Huron as the early explorers, Champlain and Brule did not venture inland. However, they did record the Indigenous names for the rivers. By 1763 a little more was known of the area as illustrated in this unknown map-maker’s illustration. Rivers and names of the Indigenous peoples are listed. The Spanish River was called the Estiaghicks, and the peoples who lived along the north shore, Messesagues or Estighticks. Today, the Indigenous peoples are known as Anishanabe and are divided into various First Nations communities such as Sagamok, Mississauga and Serpent River. There were many revisions of Sanson’s maps created in the 160 years that followed. 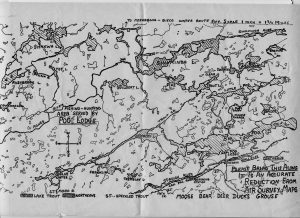 However, very few that I have seen illustrated the lakes and rivers in this area of Northern Ontario as well as this map created by John McBean. After the amalgamation of the North West Company and the HBC in 1821, La Cloche became the headquarters of the new district with McBean as the chief factor. 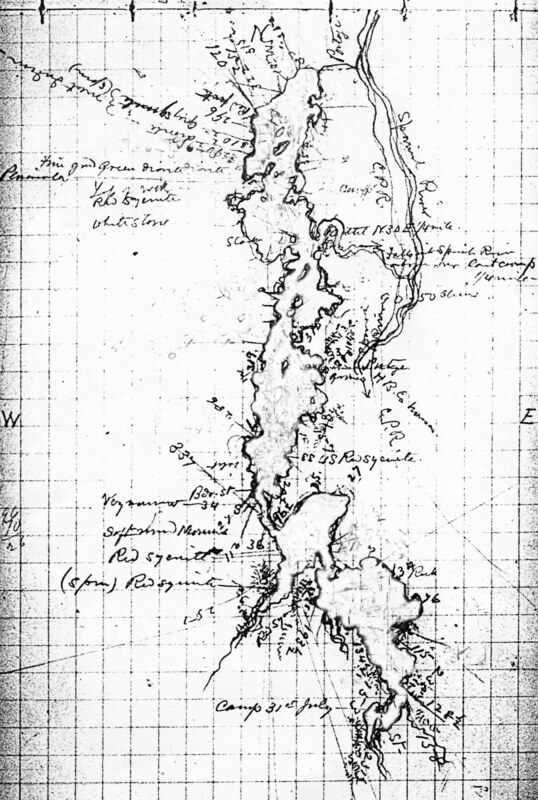 McBean asked his hunters to describe the inland waterways in his trading territory and in 1827 he created this map and attached the names given to him by his Native trappers. In this INCO Metals version of the map, the common names we use today were added under the original names. The main rivers of the region are listed: Wanapitae, Vermillion, Spanish, Aux Sables and the Wakonassin. The main lakes he included were: Birch, Panache, Wanapitae and Pogamasing, but he did not include some of the largest lakes in his territory: Biscotasing, Ramsey and Rocky Island. 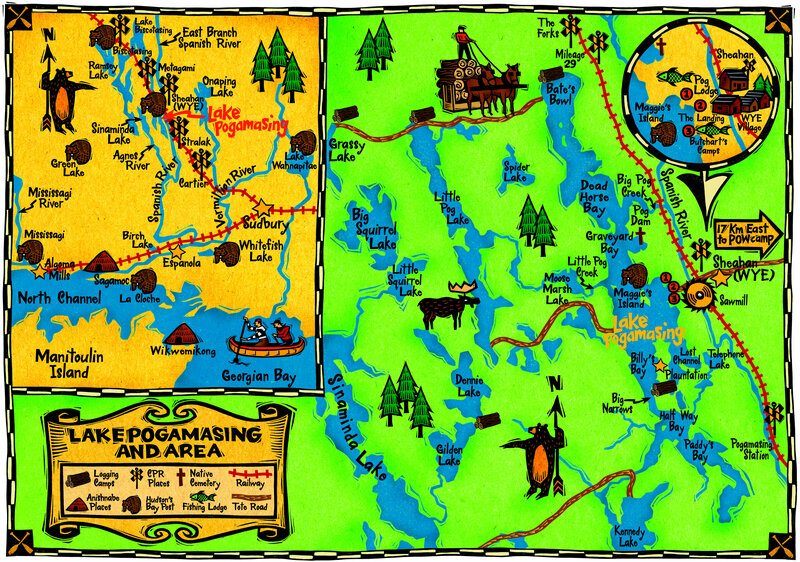 If you look just to the left in the centre of the map you can read the name “POGAMASING LAKE” under its Anishanabe name, “Pimgashcaushing.” In 1869, the HBC established a trading post with Louis Espagnol as the manager. 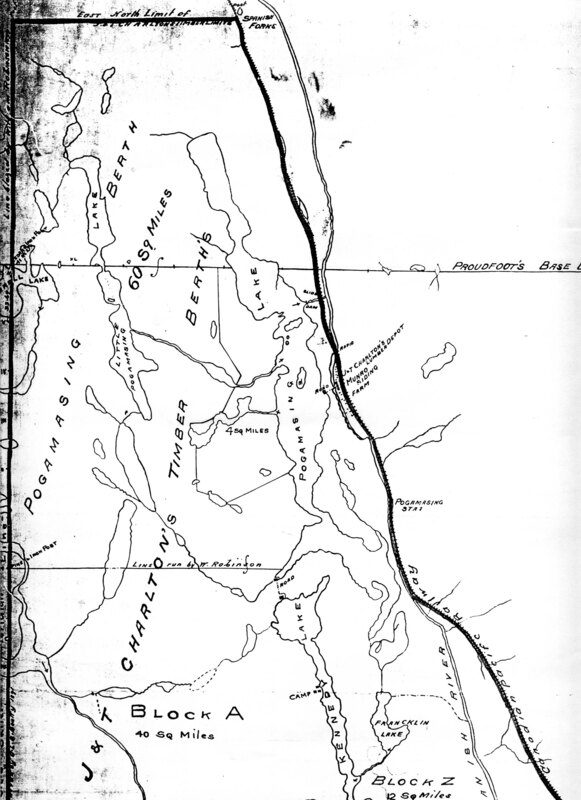 The map is only a partial portrayal of the Lake Huron District, from the Spanish River called Estimanitigon by McBean in the SW corner, to the Wahnapitae River flowing into the French River on the east. 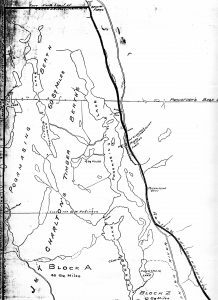 For some unknown reason the western part of the district was not included, especially the Mississagi River which is surprising because there was a trading post near the mouth of the river and an inland one at Green Lake. 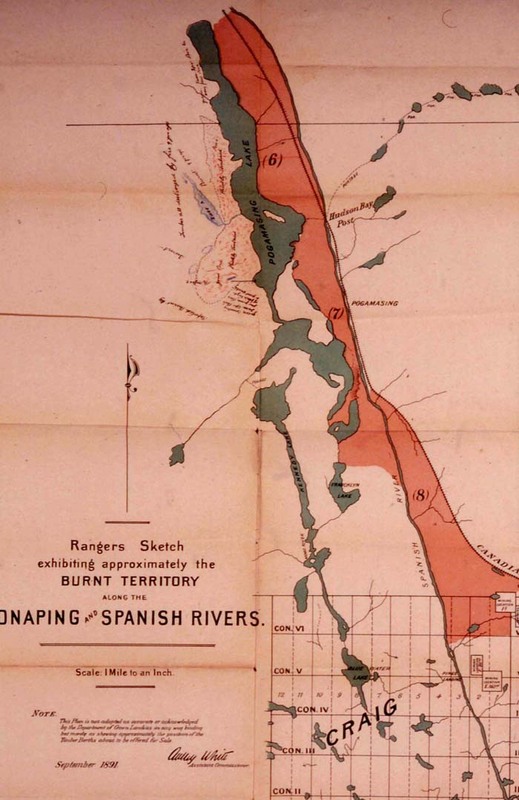 The Spanish River’s name evolved through various versions, but ended up being called the Spanish because of the ethnic origin of a trader who camped alongside the river. 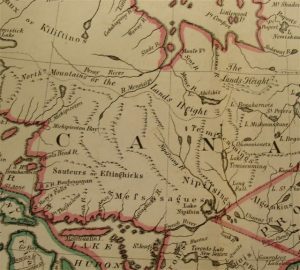 Although the British government created the Province of Canada in 1840 it took several years before Northern Ontario was open to development. 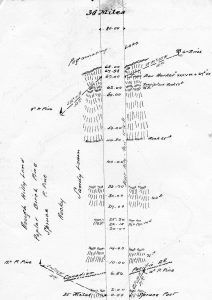 1848 Albert Salter surveyed the first baseline along the North Shore of Georgian Bay. There was pressure from the resource companies to open up the new territory so the government sent Benjamin Robinson to conclude a treaty with the Indigenous people along the North Shore. The Robinson-Huron Treaty was was concluded in 1850, giving the government title over the territory. After Confederation in 1867, Macdonald’s promise to build a railway to the Pacific was halted over the 1872 election scandal, but his re-election in 1878 restored his Pacific dream. By an unusual twist of fate, it was built through the Spanish River valley and in August of 1884, the railway construction crew passed through the Pogamasing area. The effect on the fur trade was devastating and four years later the HBC closed the Pogamasing post, and within ten years the complete district was wiped out. However, the lumber industry was pleased as they now had access to the massive inland pine forests. A major new lumber industry was initiated that would last for 50 years in the Pog area. 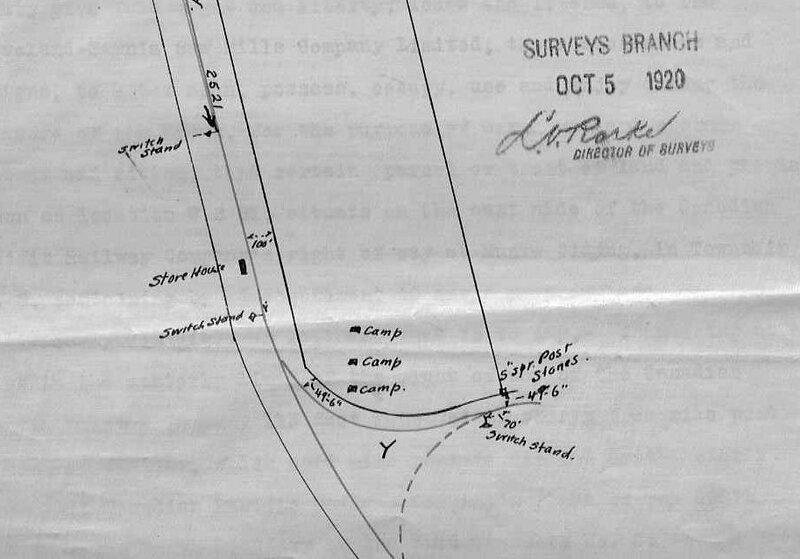 Soon after the railway was completed the government sent surveyors to map the new area in order to assess and map the land for development of the lumber, agricultural and mining resources. 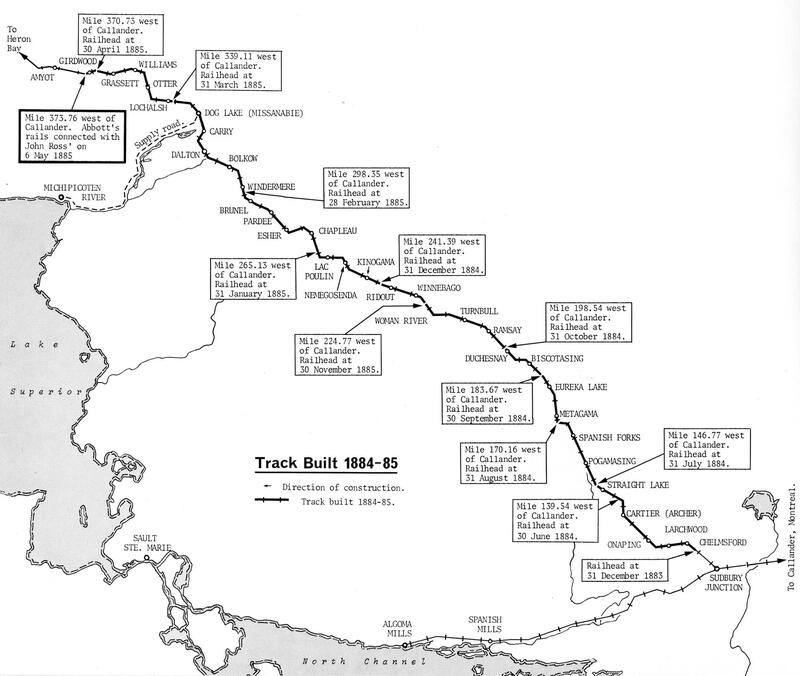 This was a massive undertaking because the railway had opened up thousands of square miles of undeveloped territory. 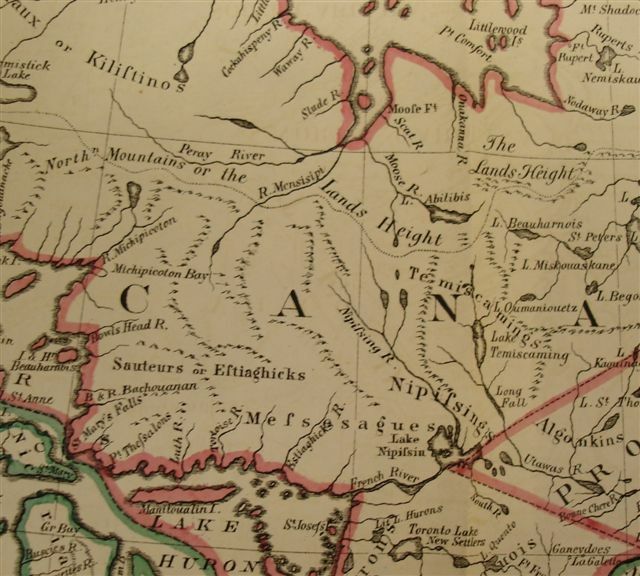 Shortly after Proudfoot completed his survey for the provincial government, the Geological Survey of Canada in Ottawa sent their surveyor, Robert Bell, to look for mining possibilities in the new territory. 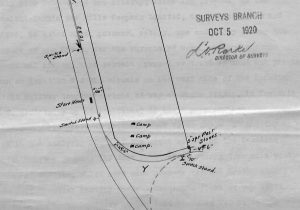 Although provincial land surveyors were to assess resources, the Ottawa surveyors were specifically interested in mining. I was especially interested in Bell because I learned that my grandfather was named after his grandfather, William Bell, a Presbyterian minister from Perth, Ontario. 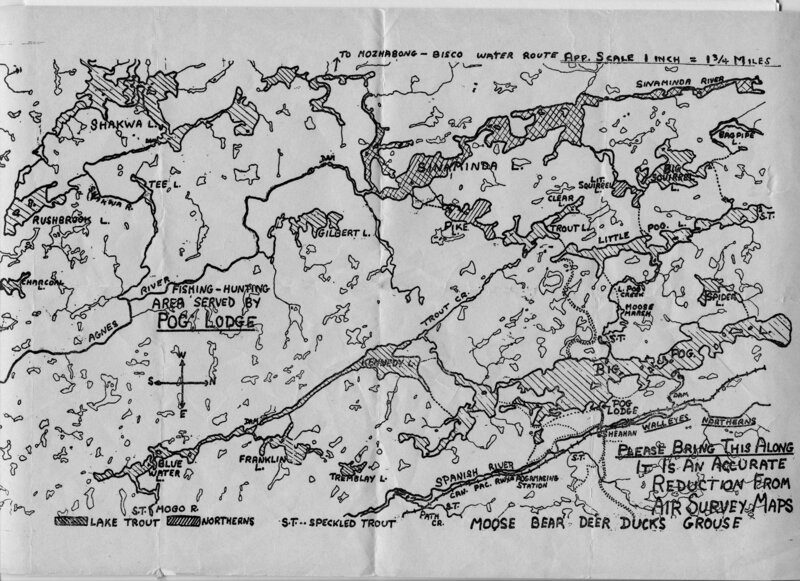 Bell spent two days canoeing around Pog and sketched this map. 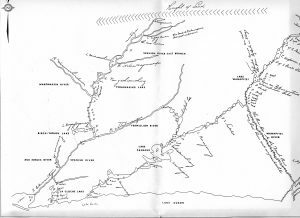 This is a map of the lake before it was dammed and it is interesting to see that the southern part is linked to the central part, despite a long and shallow narrows, joining the two sections. 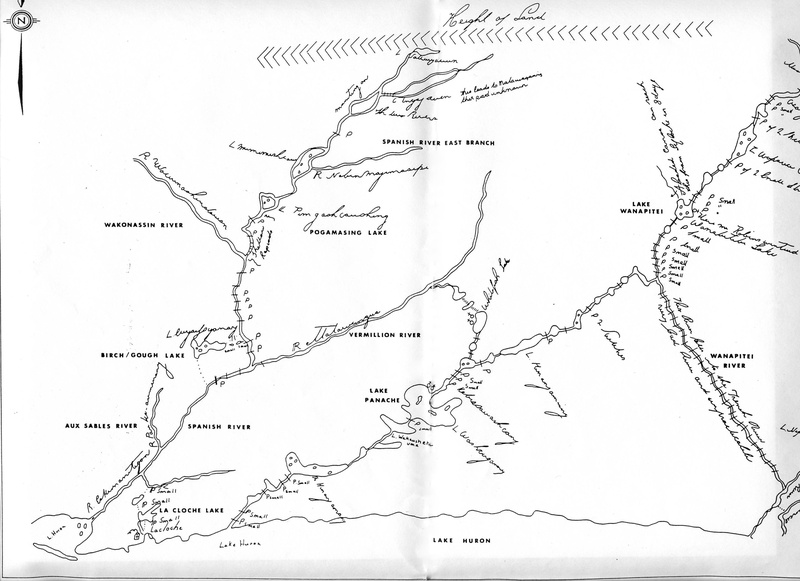 Bell also did an extensive drawing of the Spanish River and other major lakes in the region, along with other areas across Canada for the Geological Survey. Although I was first attracted to this map because of its colour, it fascinated me because it combined some interesting information about the area. 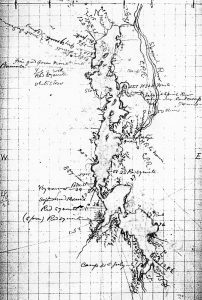 There is a rough drawing of Pog (it doesn’t appear that the provincials knew of Bell’s map) and Kennedy Lake to the south. Craig township has been completely surveyed because of the mining interest. Proudfoot’s Line is marked across the top of the map and the CPR vertically bisects the map . 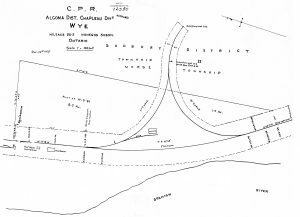 There is also a former canoe/portage route to Lake Onaping cutting across Proudfoot’s Line used when there was a trading post on Pog. What is most significant about this map was the reason for its creation: to advertise the burnt timber berths to prospective lumber companies because of a forest fire. As a result the Department of Crown Lands (forerunner of the MNR) had to open up the area prematurely to logging or lose the timber to parasites. Just below Proudfoot’s Line there is some handwriting that indicates that an early forest fire had burned in the region in 1882. I had portaged through this area many times on my way to Little Pog and had noticed a score or more of these standing burnt poles but had not known when the fire occurred. 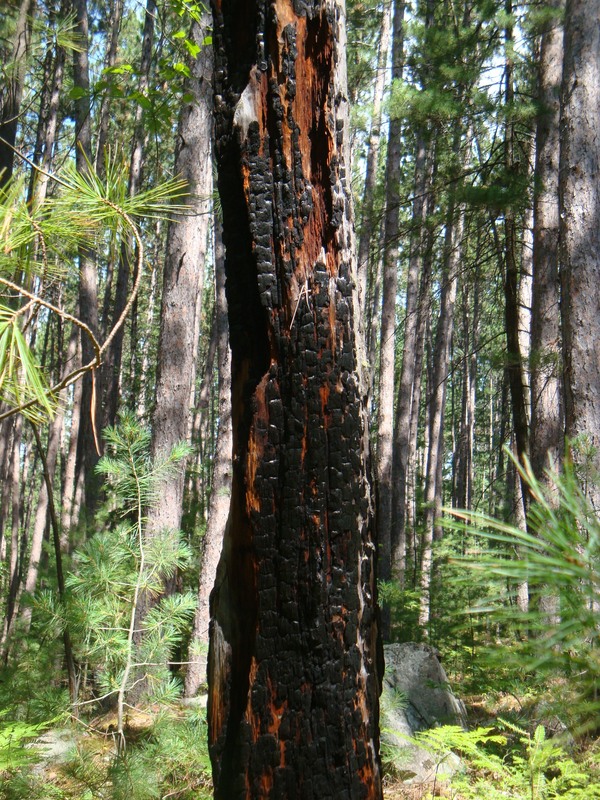 I now realized that these charred poles were from this fire and they are still standing 136 years later! 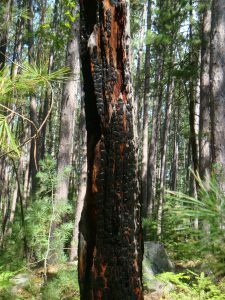 Although logging began soon after the burnt timber auction, the Department of Crown Lands also proceeded to survey the area to facilitate logging beyond the fire. J. F. Whitson (L) surveyed the first limit on the western shore of Pog. The northern line begins at Proudfoot’s Baseline, and covers an area of four square miles along the west side of the lake. 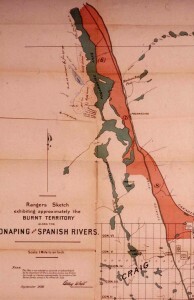 He also wrote on his map that the area had been “brule” indicating that the forest fire had scorched the area. The larger timber berth (R) contained a few smaller timber limits that were amalgamated into this larger berth: Block A & Z along with Whitson’s berth. It was put together for the Charlton brothers who wanted a larger limit and had hoped to make a fortune from logging it. They drove the saw logs down the Spanish and then towed thm by boom to their Collingwood mill. John Charlton was more of a politician – an American born member of Laurier’s shadow cabinet – and after five years he closed the operation in 1908. There had not been a stop at the mid-point of Lake Pogamasing when the railway was constructed in 1884. Instead, CP positioned stops at Pogamasing (near the south end of Pog) and Fluorite (north of where Big Pog Creek flows into the Spanish). 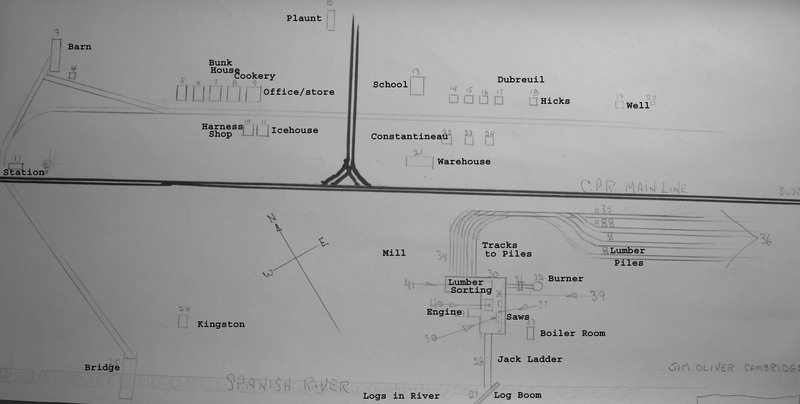 The first lumber operators in the area realized the easier access to the pine forest was from the mid-point, even with the Spanish between the railway and the lake. 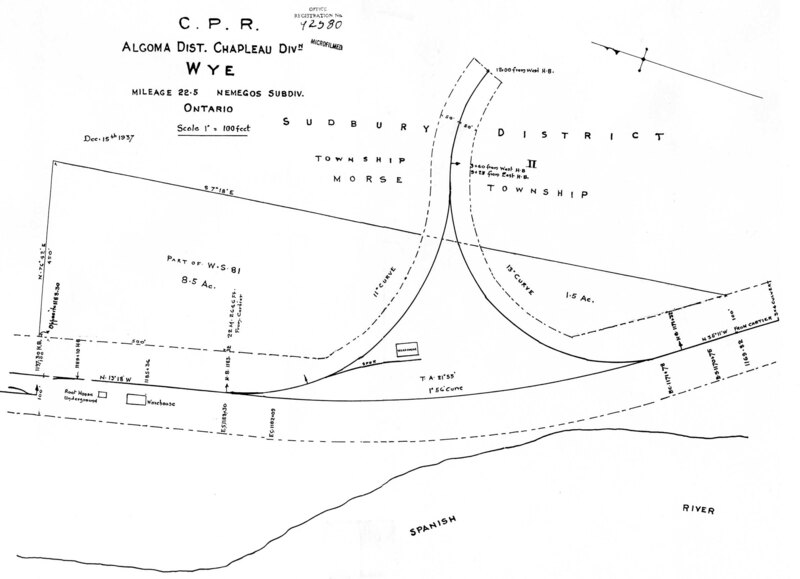 The first major logging operator in the Pog area, JW Munroe, requested that a siding be built for a storage depot alongside the CPR tracks. Consequently, the CPR named the new stop, “Munroe Siding.” The stop name would morph into other names, all associated with the railway, and soon became the major stop in this Cartier to Biscotasing section of the for well over 100 years. The first name change came in 1917 when the CP added another section to the siding to create what railroaders call a “Y,” and renamed the stop, “Wye.” The purpose for the alteration was allow locomotives to turn around. Freight loads were becoming heavier and, because of a hill at Stralak, an additional engine was needed. Once at Wye, the engine was detached, moved into the one arm of the siding, backed out to the main line, and as it was now facing east, returned to Cartier for its next assignment. 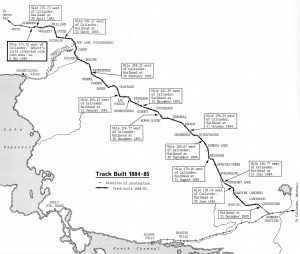 The Y remained there until 1943 when the stop was dismantled because of confusion caused by another Y up the line and renamed “Sheahan” after a CPR doctor in Chapleau. WB Plaunt closed his mill in 1940 after ten years of operation as there was little pine left after 50 years of cutting. A few families remained to establish camps on the lake, including Plaunt. He converted a former logging camp on Pog into a camp for his family and they have remained into its fifth generation. After the war, returning veterans established two fishing lodges. At Pog Lodge, Harry and Kae Ward and Betty and Andy Gibson, established their camp in 1946 and across the road, Charlie Butchart built his Butchart’s Camps a year later. The only game fish on Pogamasing was lake trout so it was necessary to go inland lakes to catch other species. 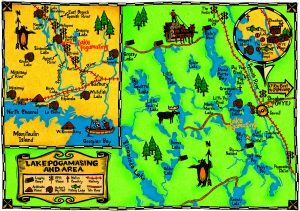 Pog Lodge established outpost camps on several lakes and created this map for their guests. Harry and Andy even went to the trouble of creating a depth chart of Pog along with fishing runs to give their guests the best chance of catching lake trout. Years later, bass and pickerel were introduced to the lake and no one had to venture far to catch fish. I was always frustrated by historical books that didn’t include a reference map where the reader could locate a place mentioned in the text. Consequently, I asked Sue Todd to create this whimsical, but accurate illustration with most of the places mentioned in my history of Pog. 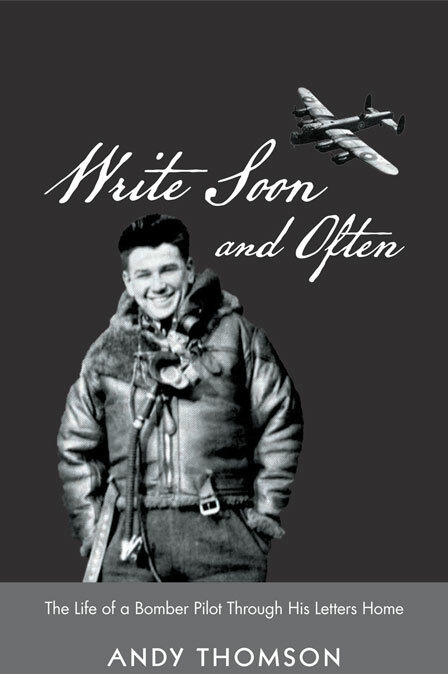 It can be easily found on the inside cover of my book.